2016 4Runner Trail (not the fancy premium) | OME 3″ lift (884 front coils, 889 rear coils), 285 KO2’s, Spidertrax Spacers, Eezi-Awn K9 Rack, Xenon Depot Xtreme HID Kit and Xtreme LED High Beams, Slee Offroad Sliders. If you are on Instagram and follow any number of builds, you are likely following @swellrunner. If not, head over to Instagram/YouTube and follow the Swell Runner pages. 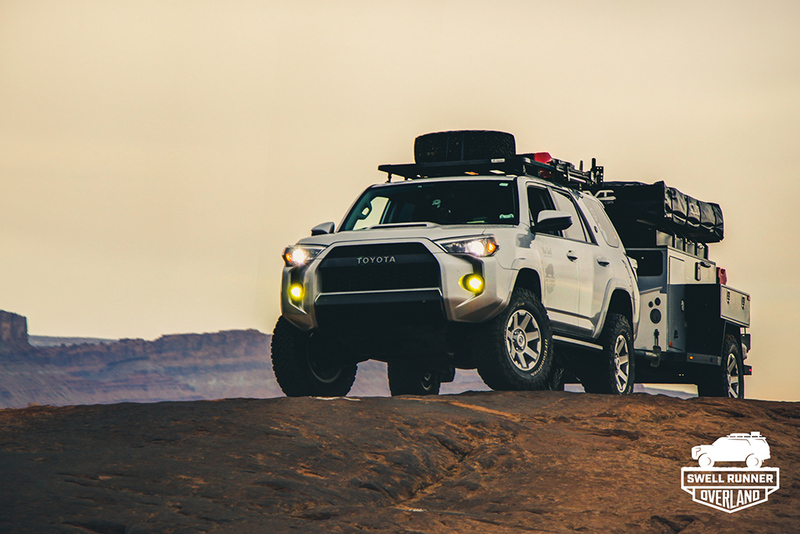 The Swell Runner Instagram and YouTube accounts are filled with information-packed overland adventures and the lifestyle of what it takes to be comfortable off-road. We have followed the Swell Runner journey from the beginning and it sure has been an inspirational ride so far. This is one 4Runner IG page to follow and an amazing VLOG to subscribe to. 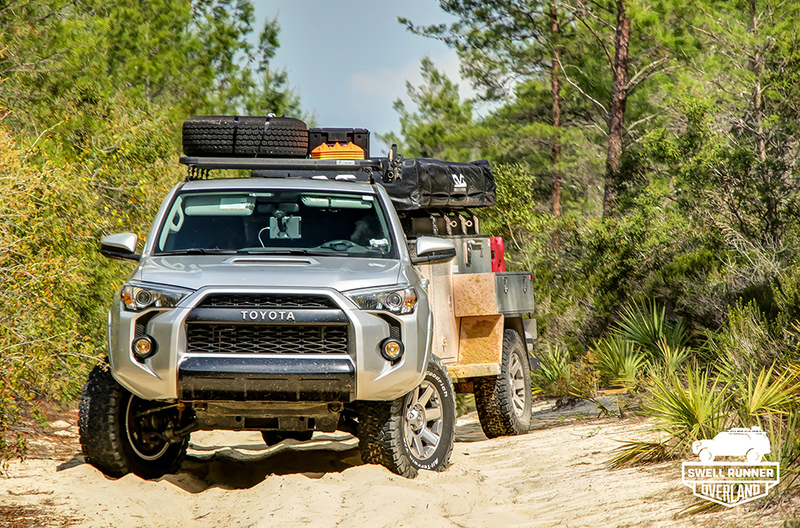 Swell Runner’s journey takes you from the very beginning of the stock 4Runner through various expeditions, events, travels and a few how-to tips here and there. Over the course of a few months, it seemed like the Swell Runner build and journey went from 3000 followers to over 10,000 followers and there is no question why. The content, storyline, quality of edits and thought that goes into his pages are truly impressive. Jason, you are an inspiration to the whole community! Keep it rolling! Enough about the story, let’s get into the build. The OME (884 front coils, 889 rear coils) are great all-around coils for an enhanced suspension performance on and off-road. OME pulls its heritage from its name Old Man Emu, like the Emu bird that excels under extreme conditions with powerful legs that absorb almost all its impact. 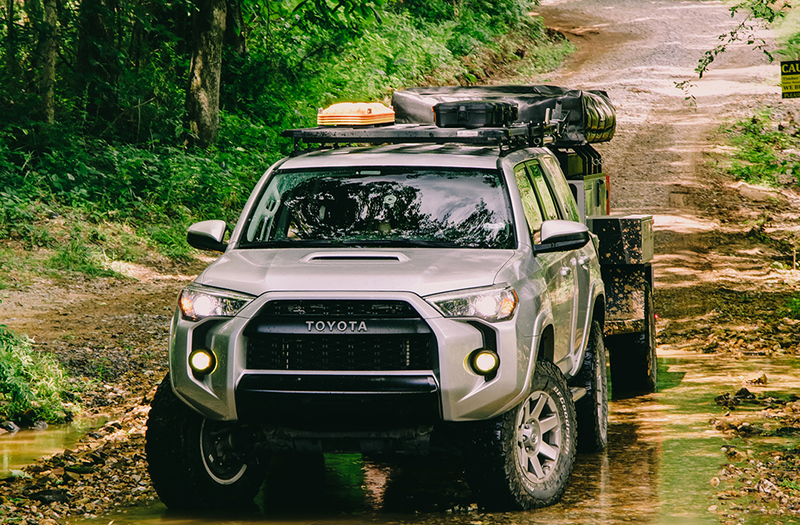 Like the Emu, the 4Runner OME suspension is designed to move over various types of terrain while allowing the body of the vehicle virtually motionless. The 884 front coils and 889 rear coils are the light/ medium coils that serve a very well-rounded purpose on and off-road. OME offers a large line of shock combinations engineered to improve vehicle ride, handling, and control under various loads. While the 884 front coils and 889 rear coils are not designed for a plethora of weight like aftermarket rear and front bumpers, they can still handle anything you throw at them. We also have a pair of the BFG KO2’s wrapped on one of our 4Runners. Wow. These tires are a true masterpiece and it is no wonder why so many 5th Gen owners have a set wrapped on their wheels. 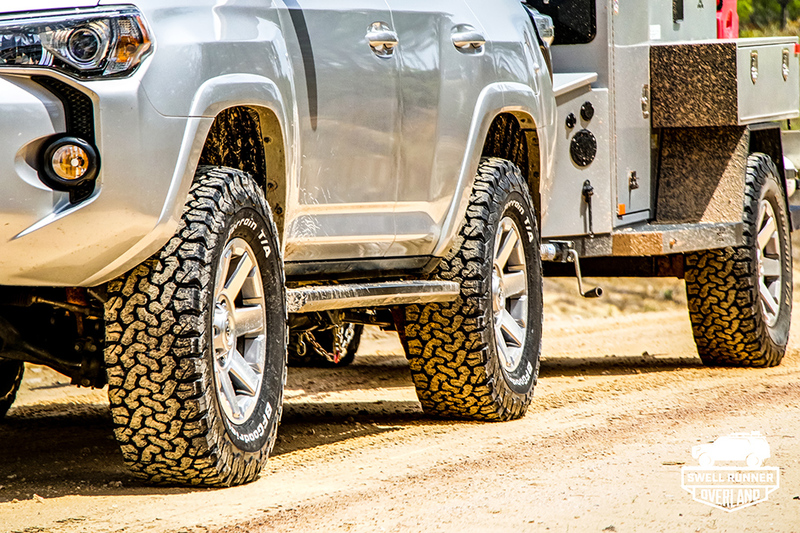 These tires work their magic off-road through all types of terrain; snow, ice, sand, gravel, loose rock, chunky rock, and whatever else you can throw at them. No matter what size you are running; 275/70/17 or the 310/70/17, you will not be disappointed with these tires. They have an incredibly unique tread pattern that is designed for all areas of the trail and once winter comes, you are safe behind the wheel with the KO2’s. Many owners install spacers for a few reasons. When you lift your 4Runner it’s going to pull the front wheels in towards the body because you are pulling the lower A-arms (LCA’s) and the upper control arms (UCA’s) in some. The spacers will push the actual wheel back out away from your wheel well. You can tell that there is a big difference after you lift your 4Runner, as the wheels come in. And again, you will notice a big difference when you push the wheels back out with a set of spacers. This shot of Swell Runner shows a set of Spidertrax Spacers bolted on. 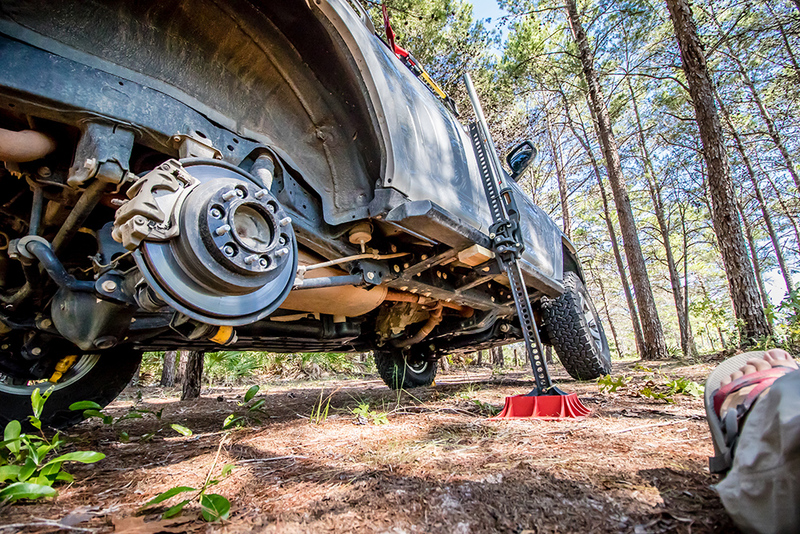 Many owners say the Spidertrax Spacers handle better too. This set of wheel spacers is the go-to spacer set. There are so many roof racks to choose from when it comes to the 5th Gen. The Eezi-Awn K9 2.2 Meter Rack is a superior performer in almost every category of the 5th Gen Roof Rack manufacturers. Eezi-Awn has over 30+ years experience in designing, manufacturing and supporting overland and expedition products. The Eezi-Awn K9 is made of extruded aluminum which is incredibly light-weight. When we through more weight on top of our 5th Gen, we want our rack to be as light as possible and this is where the Eezi-Awn K9 excels. The 2.2 meter K9 rack on the 5th Gen 4Runner is about 65 pounds. For all of you that do not know, that is incredibly light for a roof rack. Some of the other well-known roof racks are well over 100 pounds. All in all, solid roof rack option for the 5th Gen. When it comes to lighting on a 4Runner, well the stock lights are not that great. 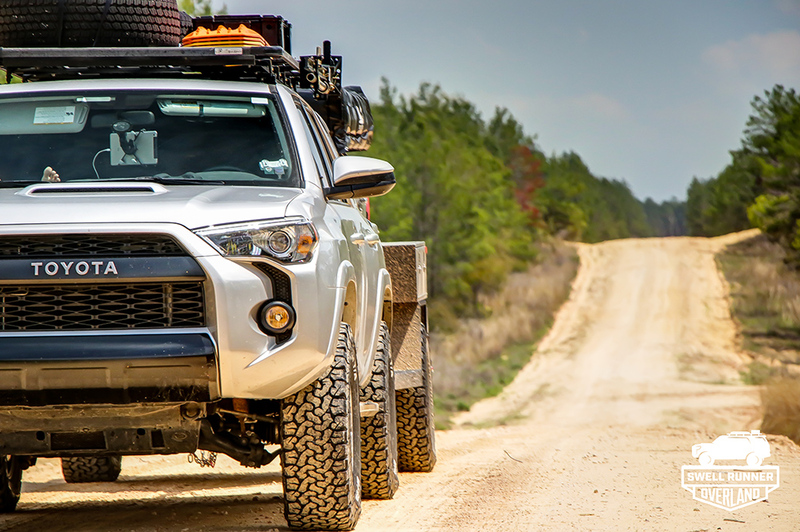 Swell Runner features some of the best aftermarket 4Runner Fog Lights as well as aftermarket 4Runner Headlights lighting components you can get within the factory set-up. Swell Runner is running the XenonDepot HID High Beams and HID Yellow LED Fog Lights. 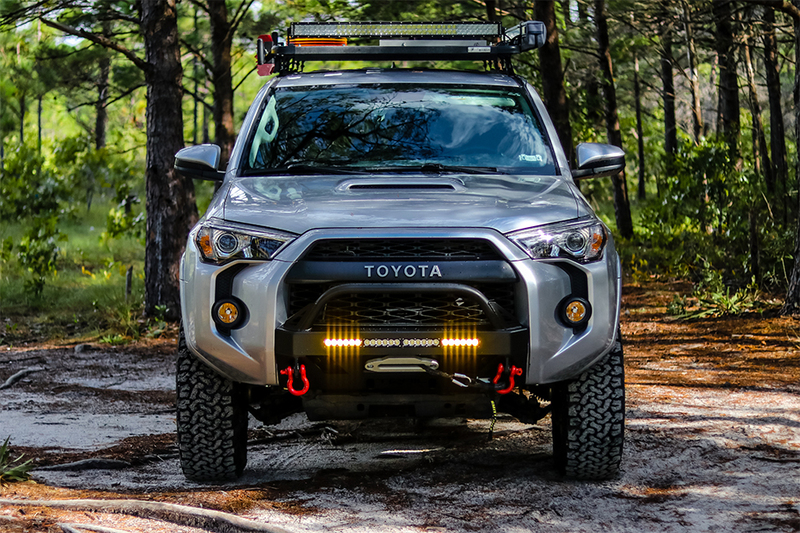 XenonDepot offers a full line of lights that are trusted in the 5th Gen 4Runner world. You really can’t go wrong with anything from XenonDepot. Whooo, these sliders are nice. Coming in at right around $1000, the Slee Sliders are a pure work of art and Swell Runner does an amazing job of making these sliders look pretty. They function as much more than a rock slider. You can use these sliders on a jack mount and they also function as an OEM like step all while being incredibly durable. A saucy addition to any build is the C4 Fab Lo Pro Front Bumper. The C4 bumper comes feature packed with many options to make it unique to your build. C4 Fab offers many different light options as well as winch mount options that can be customized in a number of ways. This front bumper has to one of my personal favorites because it offers the same functionality of other front bumpers without having to cut your OEM grill off. And, the 5th Gen has a glorious front-end, why remove it? As more is yet to come for this beautiful 4Runner, we salute you Swell Runner for the inspiration and time you have put into your 4Runner. We can’t wait to see what’s around the corner for you and your upcoming journeys.